Rotary Feed-Through supports up to 26 electrical signals. With DDF-I rotary feed-through, 13 of 26 electrical signals are used for valve actuation, while air and vacuum are supplied to actuators via fluid feed-through and slip ring contacts. Center bore enables feed-through of cables, liquids, workpieces, or use of camera. Product's ISO flange pattern connects device to different robots without adapter. Enabling rotation of last robot axis by over 360Â°, without cable and hose twisting, unit also has electric plug contacts to simplify cable changing. The DDF-I is the world's first rotary feed-through with integrated BUS technology. It can be used for connecting mechatronic gripper modules, valves, or sensors located downstream from a rotary axis for especially stable control of processes. Up to 26 electric signals are transmitted simultaneously, 13 of which are for the actuation of valves. Air and vacuum are supplied to the actuators through a fluid feed-through and slip ring contacts reliably supply the tool with power, even at high speeds. The center bore of the DDF-I allow the feed-through of cables, liquids, workpieces, or the use of a camera. Continuous rotary movements are also possible with the module. Thanks to the ISO flange pattern, it can be connected to many different robots without the use of an adapter. 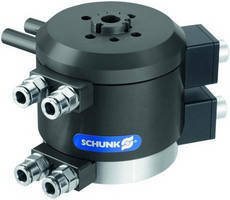 The DDF facilitates rotation of the last robot axis by more than 360° without hoses and cables twisting around the axis. Electric plug contacts allow for an easy change in case of a cable break at the robot arm or gripper. Hermetic Feedthroughs suit high-current applications. Hermetic Feedthrough is used with fiber optic connectors. SMT Feedthrus support operation through 25 GHz.